The Chess Drum releases new blog! The Chess Drum has finally released the long-awaited chess blog to complement the 5900-page website. 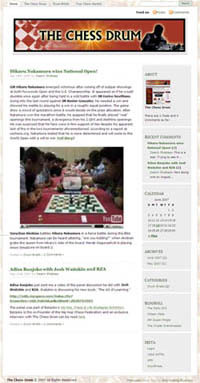 The blog will provide briefs to main stories, video footage, games (and analysis), chess theory, tournament announcements, and live coverage from tournaments. There are hundreds of chess blogs dotting the Internet landscape and The Chess Drum has decided to enter the world of blogging. Such discussion groups have been around for decades and the use blogs has blossomed to make sites more interactive and dynamic. Corporations use them for customer relationship management (CRM) and news organizations use them to broaden readership and to further democratize the dissemination of information. The goal for the new blog is to increase the interaction between those who frequent the site and for those how merely want to take part in a myriad of information within the chess genre. The blog will develop its character, but will remain committed to providing quality chess coverage.